Extend the growing season by starting your spring flowers indoors. Flowers started indoors have 4 to 10 weeks head start on those started outside, producing stronger plants that bloom earlier. In cooler climates, this is often necessary, especially for non-native blooms that require a longer growing season. Purchase your seeds from a reputable dealer and make sure that the planting instructions are on the envelope or supplied with the seeds. Different types of flowers must be started at different times to be ready for spring planting. Sterilize your growing pots or flats. Mix 1 part bleach to 10 parts water and rinse the containers in the solution. Rinse with clear water and allow to air dry completely. Fill each flat or container with purchased seed starting soil or vermiculite. Fill to within ¾ inch of the rim of the container. Plant the seeds to a depth that is twice the size of the seed, except for very fine seeds that are sprinkled on top the soil. Replace the soil over the seed loosely. Space seeds in flats 3 inches apart or sow 1 seed per pot. Water the container from the bottom or lightly mist the top of the soil with a water spray bottle. Avoid pouring water in from the top as it may disturb the seed. Place the containers in plastic bags or cover the top tightly with plastic wrap to conserve moisture and warmth. Place in a shaded area with a temperature between 65 to 75 degrees Fahrenheit. 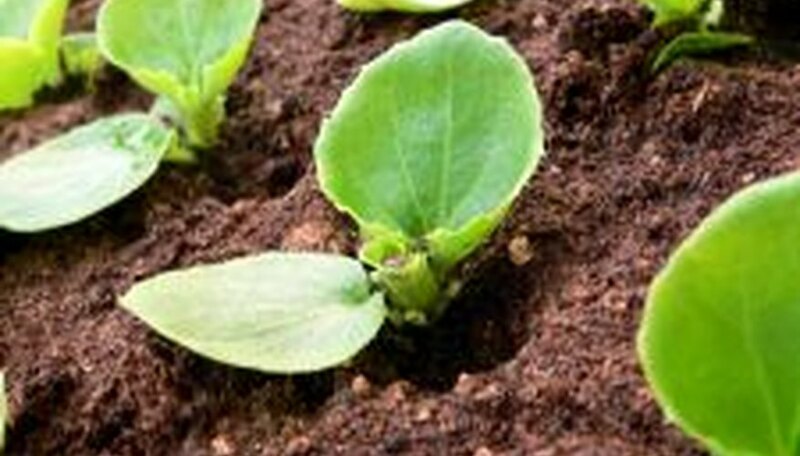 Remove the plastic as soon as the sprout breaks the surface of the soil. Move to an area that receives plenty of sunshine or under a grow lamp. Keep the soil moist but not soggy. Water from the bottom to avoid damaging the seedling. Apply fertilizer 3 to 5 days after germination. Dilute houseplant fertilizer to half strength with water and apply to the soil. Plants are ready to be moved to larger pots if necessary when they have formed at least one set of true leaves. Label your trays immediately after sowing as many seedlings look the same. Remove any seedlings or soil and discard if disease or fungus appears.